Aaron Hinks photo Environmentalist David Suzuki speaks at the ‘Save Hawthorne Park’ rally Saturday afternoon at Surrey City Hall. 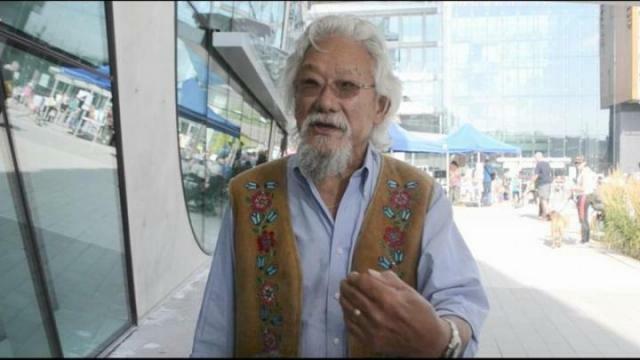 Sep. 16, 2017 5:20 p.m.
At the foot of Surrey’s tallest skyscraper, Surrey City Hall and the Surrey Library, renowned environmental activist David Suzuki expressed a concern for future generations at a ‘Save Hawthorne Park’ rally Saturday afternoon. In a media scrum prior to the event and during his presentation, Suzuki thanked Surrey city council for being part of the David Suzuki Foundation’s Blue Dot initiative, which moves towards making it a constitutional right for Canadians to have a healthy environment. “A healthy environment is clean air, clean water, clean soil, but it means a variety of life around us, nature… We live in cities and we think this is a habitat for us. No, you need something to cleanse the air, cleanse the water. We need nature to be with us as well,” he told media moments before standing behind the podium. Suzuki made it clear to the crowd that he was not representing the Suzuki foundation, any political party or corporation. He said he was, however, there to speak as an individual, grandfather, a scientist and an elder. More than 200 people attended. In discussion with the media, Suzuki took issue with governing bodies not representing their people, but did not specifically mention Surrey. “We have what I think is called a democracy. And in a democracy we tell the politicians what we want. The problem today is two-fold. One is corporations put a lot of money into political campaigns and guess what? Whoever pays the piper calls the tunes. For me, get corporate money out of the political process because they call the shots,” he said. Another issue, he said, is that only 20 to 30 per cent of people vote during elections. Saturday’s event was organized by the “Save Hawthorne Park” group, which opposes city council’s plans of building a road through the park as part of the 105 Avenue Connector project. After delivering a 5,000-name petition to Surrey council last July, opponents were given until Sept. 22 to collect 30,372 signatures in order to stop the civic government from proceeding with the project. At the time of Saturday’s event, the group had collected approximately 10,000 signatures.